Acrylic display case designed to hold 1 regular size bottle of soda or beer. Perfect for the new popular 7oz bottles. Inside Measures 3 1/4" x 3 1/4" x 8 1/2". Case features optically clear, richly beveled UV protected acrylic with a black base. Comes with 1 free nameplate. Acrylic display case designed to hold 1 long neck size bottle of soda or beer. UV protected acrylic with a black base. Comes with 1 free nameplate. Etched Glass display case designed to hold 1 regular or long neck size bottle of soda or beer. Case features optically clear, richly beveled UV protected glass with a wood base and cherry or black finish. The floor is also mirrored so you can see the entire bottle. Comes with 1 free nameplate. Inside dimensions 3 1/4 x 3 1/4 x 10". the glass. The location of the etching will be centered on the lower part of the front panel. panels etched or a traditional engraved nameplate - plaque, please call or email us. Glass display case designed to hold 1 regular or long neck size bottle of soda or beer. Acrylic display case designed to hold 1 six pack of regular size soda or beer bottles. Case features optically clear, richly beveled UV protected acrylic with a black riser base. Comes with 1 free nameplate. 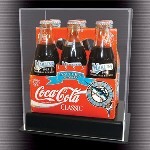 Acrylic display case designed to hold 1 six pack of long neck size soda or beer bottles. Measures 5 3/4'' x 8 1/2'' x 10 1/4''. Case features optically clear, richly beveled UV protected acrylic with a black riser base. Comes with 1 free nameplate. Acrylic display case designed to hold 1 regular size can of soda or beer. with a black acrylic base. Comes with 1 free nameplate. Our most economical display case. 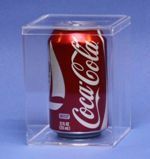 Made of high impact injection molded plastic - acrylic display case designed to hold 1 regular size can of soda or beer. Measures 4" x 4" x 5". Comes with 1 free nameplate. Glass display case designed to hold 1 regular size can of soda or beer. cherry or black finish wood base. The floor is mirrored so you can see the entire can. Acrylic display case designed to hold 1 regular size can of soda or beer. Measures 5 3/4'' x 8 1/2'' x 5 1/2''. Case features optically clear, richly beveled UV protected acrylic with a black riser base. Comes with 1 free nameplate. Solid hardwood cabinets of beautiful design and construction. A door keeps inquisitive fingers away, as well as dust! to create a large liquor collection or other collectibles. (item/shot glasses are not included). Includes up to 4 free name plates. Space between Shelves: 6 1/4"
A glass door keeps inquisitive fingers away, as well as dust! or beer cans. Mirrored back and removable glass shelves. This case can display up to a total of 24 standard size soda cans. Completed with a crown base and header design. (items inside are not included). Space between Shelves: 2 5/8", 5 3/8"
Quality solid hardwood cabinets of beautiful design and construction. Doors keep inquisitive fingers away, as well as dust! of 12 display shelves! Includes heavy duty metal brackets for wall hanging. action figurines, pez candy dispensers, and other similar size collectibles. Completed with a crown base and header design. (shot glasses are not included). Includes up to 12 free name plates. Inside Compartments: 2 1/2", 5 1/4"